This mountain gun was the main armament of Mountain Batteries 1870-1880. 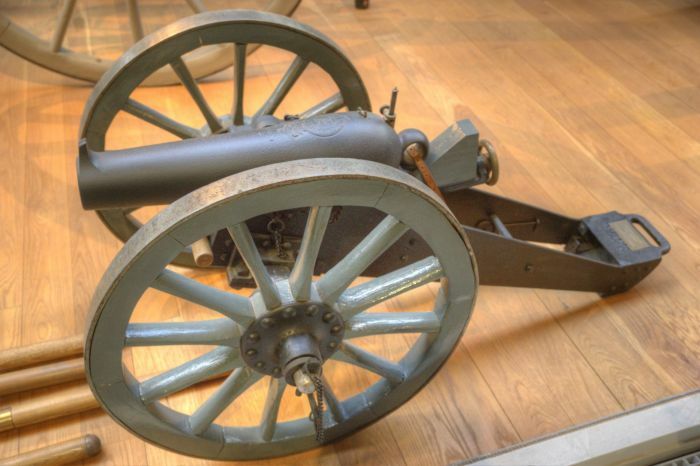 It was in use on the North-West frontier of India and in the first Boer War 1880-81. The barrels were of 150lb and 200lb. This carriage consists of two brackets, two transoms, a trail piece, axletree, and wheels. The brackets are of plate iron, with pieces cut out, to diminish the weight, they are strengthened by a piece of angle iron riveted along the upper edge. They are parallel from the breast to the second transom, from which they rapidly converge towards the point. For Indian service the trail eye is rectangular. The bracket plates are recessed to receive the axletree, and pieces of angle iron are riveted round the recesses to form bearings for it. Bearing pieces of angle iron are riveted to the point of the trail. The axletree and wheels are of the special class. The former is solid, and its arms are without lead or hollow ; it is secured to the brackets by clips. The carriage is fitted with a stool bed of tee-iron, so formed in front as to hang loosely on a cross bar between the brackets, while in the rear it has two studs, one at each side, which rest in racks riveted to the brackets. By this arrangement the slope of the bed, and, consequently, the elevation of the gun, can be very considerably varied. A sliding coin is attached to the stool bed by clips; it is worked by a screw which is held in a bearing in the end of the stool bed, and enters a nut in the coin, the screw is turned by a hand wheel. A check rope with loop and toggle at each end is issued with the carriage; when not in use it is carried strapped inside the right bracket near the point. The carriage forms a load for one mule, and the wheels for another.